Boy, do they have an apostate! The apostates who concluded their voting at around 7:10 p.m. Rome time, got a real doozy of an apostate. 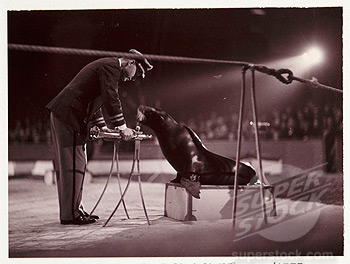 His audition must have gone over better than Timothy Michael Dolan's. They got Francis, The Talking Apostate! Jorge Mario Bergoglio, now the sixth in the line of the false popes of the Catholic Church's counterfeit ape, the counterfeit church of conciliarism, is a walking, talking mass of confusion along the lines of Timothy Michael Dolan, albeit without Dolan's backslapping, glad handling and constant stream of ad-lib jokes. Born on December 17, 1936, Jorge Mario Bergoglio is only nine years, eight months younger than His Apostateness, Joseph Ratzinger/Benedict XVI, Antipope Emeritus. Appearing very frail, if not unsure of himself, and known to hate being away from Buenos Aires, Bergoglio is likely to resign in the model of Ratzinger/Benedict's new and improved "democratic" concept of what the conciliarists term "the Petrine Ministry" (see Whittling Away At The Last Catholic Bastion). The runner-up in the voting that took place on April 18, 2005, that resulted in the election of then Joseph "Cardinal" Ratzinger, Bergoglio had the support of the likes of the notorious, nefarious protector of predator clergymen and propagandists of the lavender agenda named Roger Mahony (see Corrupt Chickens Come Home To Roost In Roger's Nest Of Apostates). Isn't that all you need to know? Bergoglio's election represents a total victory for the forces of Angelo "Cardinal" Sodano, the Occupy Vatican Movement's Secretary of State and his successor, Tarcisio "Cardinal" Bertone, both of whom desired a successor to Ratzinger/Benedict who would not undertake any serious reform of the curia. As will be demonstrated below, Bergoglio is a supporter of the late Father Luis Guissani's Communion and Liberation movement that was inspired by the work of such "new theologians" as the late Fathers Hans Urs von Balthasar and Henri de Lubac, carrying with it, of course, the full backing of Joseph Ratzinger (see Proud Of His Blasphemy And Of His Blaspheming Mentor). Bergoglio is unsympathetic to the restoration of the Immemorial Mass of Tradition within the conciliar structures, about which even some of those in the "recognize but resist" movement are already gnashing their teeth and rending their garments as they continue to lament the retirement of their champion, the "restorer of tradition," Ratzinger/Benedict. Of all the unthinkable candidates, Jorge Mario Bergoglio is perhaps the worst. Not because he openly professes doctrines against the faith and morals, but because, judging from his work as Archbishop of Buenos Aires, faith and moral seem to have been irrelevant to him. A sworn enemy of the Traditional Mass, he has only allowed imitations of it in the hands of declared enemies of the ancient liturgy. He has persecuted every single priest who made an effort to wear a cassock, preach with firmness, or that was simply interested in Summorum Pontificum. Famous for his inconsistency (at times, for the unintelligibility of his addresses and homilies), accustomed to the use of coarse, demagogical, and ambiguous expressions, it cannot be said that his magisterium is heterodox, but rather non-existent for how confusing it is. His entourage in the Buenos Aires Curia, with the exception of a few clerics, has not been characterized by the virtue of their actions. Several are under grave suspicion of moral misbehavior. He has not missed any occasion for holding acts in which he lent his Cathedral to Protestants, Muslims, Jews, and even to partisan groups in the name of an impossible and unnecessary interreligious dialogue. He is famous for his meetings with protestants in the Luna Park arena where, together with preacher of the Pontifical House, Raniero Cantalamessa, he was "blessed" by Protestant ministers, in a common act of worship in which he, in practice, accepted the validity of the "powers" of the TV-pastors. This election is incomprehensible: he is not a polyglot, he has no Curial experience, he does not shine for his sanctity, he is loose in doctrine and liturgy, he has not fought against abortion and only very weakly against homosexual "marriage" [approved with practically no opposition from the episcopate], he has no manners to honor the Pontifical Throne. He has never fought for anything else than to remain in positions of power. It really cannot be what Benedict wanted for the Church. And he does not seem to have any of the conditions required to continue his work. That is a pretty good summary of the man, I believe. Do not believe the mainstream media's reports about Bergoglio as being a "conservative" on doctrine. He is not. His opposition, for example, to "marriage" for those engaged in perverse sins against the Sixth and Ninth Commandments is coupled with a "respect" for individual homosexuals, meaning that it is permissible to identify oneself by virtue of being inclined to the commission of sins against nature. This is absurd as no one is to identify himself by his tendency to commit a particular sin. What defines us as human beings is that we bear the Divine impress on our immortal souls, and what defines us as Catholics is that we have been incorporated in the Mystical Body of Our Blessed Lord and Saviour Jesus Christ that is the Catholic Church at the moment of our Baptism. Then again, absurdity and contradiction are part and parcel of who Jorge Mario Bergoglio is, a total creature of concilairism, ordained as a member of the Society of Jesus on December 13, 1969, although it is unclear to me at this point whether the invalid conciliar rite of presbyteral installation was used. Paradox and absurdity are part and parcel of who is man is. How can you expect otherwise? He is trained according to the Hegelian methodology advanced by the likes of Von Balthasar and De Lubac that Ratzinger just spent the past eight years advancing under the banner of the "hermeneutic of continuity." What is my evidence for this? Well, how about Bergoglio's own words, contained in an interview published by Communion and Liberation's 30 Days magazine? Paradox and contradiction worthy of His Apostateness, Joseph Ratzinger/Benedict XVI, Antipope Emeritus. "One does not remain faithful, like the traditionalists or the fundamentalists, to the letter"? "But he appears so humble and simple," some might say. I say, so what? Humility and simplicity without the Catholic Faith mean nothing. And Francis, The Talking Apostate hath not the Catholic Faith. Q. Is this what you would have said at the Consistory? BERGOGLIO: Yes. I would have spoken about these three key points. BERGOGLIO: Nothing else… No, perhaps I would have mentioned two things of which there is need in this moment, there is more need: mercy, mercy and apostolic courage. Q. What do they mean to you? BERGOGLIO: To me apostolic courage is disseminating. Disseminating the Word. Giving it to that man and to that woman for whom it was bestowed. Giving them the beauty of the Gospel, the amazement of the encounter with Jesus… and leaving it to the Holy Spirit to do the rest. It is the Lord, says the Gospel, who makes the seed spring and bear fruit. Q. In short, it is the Holy Spirit who performs the mission. BERGOGLIO: The early theologians said: the soul is a kind of sailing boat, the Holy Spirit is the wind that blows in the sail, to send it on its way, the impulses and the force of the wind are the gifts of the Spirit. Without His drive, without His grace, we don’t go ahead. The Holy Spirit lets us enter the mystery of God and saves us from the danger of a gnostic Church and from the danger of a self-referential Church, leading us to the mission. BERGOGLIO: I didn’t say that pastoral systems are useless. On the contrary. In itself everything that leads by the paths of God is good. I have told my priests: «Do everything you should, you know your duties as ministers, take your responsibilities and then leave the door open». Our sociologists of religion tell us that the influence of a parish has a radius of six hundred meters. In Buenos Aires there are about two thousand meters between one parish and the next. So I then told the priests: «If you can, rent a garage and, if you find some willing layman, let him go there! Let him be with those people a bit, do a little catechesis and even give communion if they ask him». A parish priest said to me: «But Father, if we do this the people then won’t come to church». «But why?» I asked him: «Do they come to mass now?» «No», he answered. And so! Coming out of oneself is also coming out from the fenced garden of one’s own convictions, considered irremovable, if they risk becoming an obstacle, if they close the horizon that is also of God. The danger of a self-referential Church? Overthrowing all your functionalist solutions, your consolidated pastoral systems? Coming out of oneself is also coming out from the fenced garden of one's own convictions, considered irremovable, if they risk becoming an obstacle, if they close the horizon that is also of God? How is this not identical to what Joseph "Cardinal" Ratzinger, evoking the spirit of Hans Urs von Balthasar, wrote in Principles of Catholic Theology in 1982? Francis the Talking Apostate is busted. Unfortunately for him, though, he does not realize this. Q, What should one do? BERGOGLIO: Look at our people not for what it should be but for what it is and see what is necessary. Without preconceptions and recipes but with generous openness. For the wounds and the frailty God spoke. Allowing the Lord to speak… In a world that we can’t manage to interest with the words we say, only His presence that loves us, saves us, can be of interest. The apostolic fervor renews itself in order to testify to Him who has loved us from the beginning. Q. For you, then, what is the worst thing that can happen in the Church? Generous openness to what? The devil, that's what. Quoting De Lubac on spiritual worldliness, which means ridding the Catholic Church of the belief that she alone possesses truth and has the sole right from God to teach, govern and sanctify men? The book presented today, El atractivo de Jesucristo, is not a theological treatise, it is a dialogue of friendship; these are table conversations between Father Guissani and his disciples. It is not a book for intellectuals, but for people who are men and women. It is the description of that initial experience, which I shall refer to later on, of wonder which arises in dialogue about daily experience that is provoked and fascinated by the exceptionally human and divine presence and gaze of Jesus Christ. It is the story of a personal relationship–intense, mysterious, and concrete at the same time–of an impassioned and intelligent affection for the person of Jesus, and this enables Fr. Giussani to come to the threshold, as it were, of Mystery, to speak familiarly and intimately with Mystery. 7. However, this Agnosticism is only the negative part of the system of the Modernists: the positive part consists in what they call vital immanence. Thus they advance from one to the other. Religion, whether natural or supernatural, must, like every other fact, admit of some explanation. But when natural theology has been destroyed, and the road to revelation closed by the rejection of the arguments of credibility, and all external revelation absolutely denied, it is clear that this explanation will be sought in vain outside of man himself. It must, therefore, be looked for in man; and since religion is a form of life, the explanation must certainly be found in the life of man. In this way is formulated the principle of religious immanence. Moreover, the first actuation, so to speak, of every vital phenomenon -- and religion, as noted above, belongs to this category -- is due to a certain need or impulsion; but speaking more particularly of life, it has its origin in a movement of the heart, which movement is called a sense. Therefore, as God is the object of religion, we must conclude that faith, which is the basis and foundation of all religion, must consist in a certain interior sense, originating in a need of the divine. This need of the divine, which is experienced only in special and favorable circumstances. cannot of itself appertain to the domain of consciousness, but is first latent beneath consciousness, or, to borrow a term from modern philosophy, in the subconsciousness, where also its root lies hidden and undetected. It may perhaps be asked how it is that this need of the divine which man experiences within himself resolves itself into religion? To this question the Modernist reply would be as follows: Science and history are confined within two boundaries, the one external, namely, the visible world, the other internal, which is consciousness. When one or other of these limits has been reached, there can be no further progress, for beyond is the unknowable. In presence of this unknowable, whether it is outside man and beyond the visible world of nature, or lies hidden within the subconsciousness, the need of the divine in a soul which is prone to religion excites -- according to the principles of Fideism, without any previous advertence of the mind -- a certain special sense, and this sense possesses, implied within itself both as its own object and as its intrinsic cause, the divine reality itself, and in a way unites man with God. It is this sense to which Modernists give the name of faith, and this is what they hold to be the beginning of religion. This is not a minor point at all. It is quite essential to the entire belief system of concilairism. Luis Mario Bergoglio was only repeating what he had been taught by the late Father Luigi Guissani, a belief about man's "inner sense" and "relation to God" that has been propagated throughout the Joseph Ratzinger's entire priesthood. 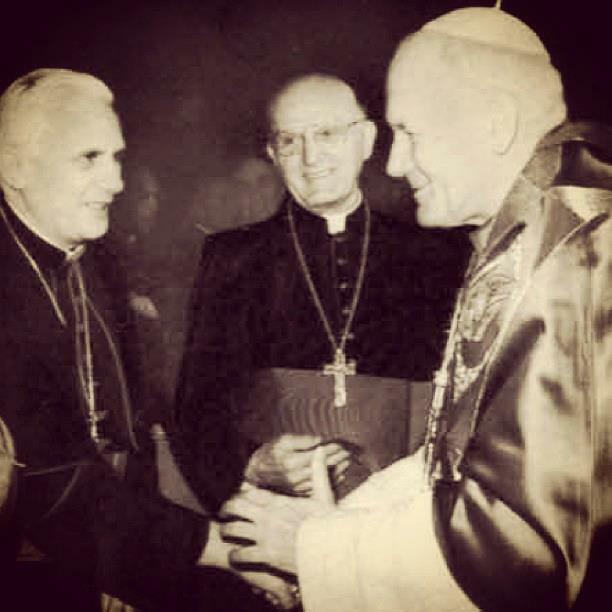 The only substantive difference between Bergoglio and Ratzinger is that the latter attempted, at least sometimes, to put a sober face on his staging of the Protestant and Masonic Novus Ordo service. Bergoglio is a full-fledged child of the "papal" extravaganza "Masses" staged by Karol Wojtyla/John Paul II. Just take a little look see at this: Conga Liturgy in Argentina. For the inspiration of this so-called liturgy, please see Origins of the Conga Liturgy. (I know. I know. You're not supposed to have this much fun in Lent. I know. 395. Finally, if the participation of the faithful and their spiritual welfare requires variations and more thoroughgoing adaptations in order that the sacred celebration respond to the culture and traditions of the different peoples, then Bishops' Conferences may propose such to the Apostolic See in accordance with article 40 of the Constitution on the Sacred Liturgy for introduction with the latter's consent, especially in the case of peoples to whom the Gospel has been more recently proclaimed. The special norms given in the Instruction On the Roman Liturgy and Inculturation should be carefully observed. In the first place, a detailed preliminary proposal should be set before the Apostolic See, so that, after the necessary faculty has been granted, the detailed working out of the individual points of adaptation may proceed. 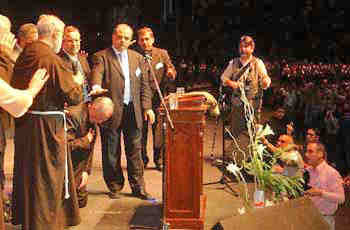 Yes, that's the master apostate of the Capuchin Fathers, Father Raniero Cantalamessa, who specializes in the preaching of heresy to the heretics who have pretended to sit on the Throne of Saint Peter, standing as then "Cardinal" Bergoglio knelt to receive his "blessing" from the Protestant televangelists. What kind of "blessings" can Protestants give? Oh, well, those that come from the devil. Speaking of the adversary, he has a great friend in "Pope" Francis, who has gone out of the way to pay his obeisance ancient enemies of the Catholic Faith in their Talmudic garb: Bergoglio Celebrates Hanukkah at Buenos Aires Synagogue, December of 2012. One will notice that the then false "cardinal" who is now the false "pontiff" was wearing a yarmulke. In other words, he is a South American version of Timothy Michael Dolan, and he has the credentials to prove that this is so. We congratulate the new Pope and wish him well in his important new responsibility. We believe that the election of Francis I is a significant moment in the history of the Church. We look forward to working with him to continue to foster Catholic-Jewish relations as we have with his predecessors. There is much in his record that reassures us about the future. Under his leadership in Buenos Aires, Cardinal Jorge Bergoglio made important strides in maintaining positive Catholic-Jewish relations following the transformational papacies of Pope John Paul II and Pope Benedict XVI - pontiffs who launched historic reconciliation between the Catholic Church and the Jewish people. Cardinal Bergoglio maintained a close relationship with the Jewish community in Argentina. He has celebrated various Jewish holidays with the Argentinian Jewish community, including Chanukah where he lit a candle on the menorah, attended a Buenos Aires synagogue for Slichot, a pre-Rosh Hashana service, the Jewish New Year, as well as a commemoration of Kristallnacht, the wave of violent Nazi attacks against Jews before World War II. In 2010, during a commemoration of the 1994 bombing, Cardinal Bergoglio called it “a house of solidarity” and added “God bless them and help them accomplish their work,” which showed his dedication and support in standing up against extremism. Yes, you just can't get more Kosher than that, can you? Here, then, it is manifest, that all fellowship with those who have not the doctrine of Jesus Christ, which is "a communication in their evil works" — that is, in their false tenets, or worship, or in any act of religion — is strictly forbidden, under pain of losing the "things we have wrought, the reward of our labors, the salvation of our souls". And if this holy apostle declares that the very saying God speed to such people is a communication with their wicked works, what would he have said of going to their places of worship, of hearing their sermons, joining in their prayers, or the like? Another day, another enemy of Christ the King and of the souls for whom He shed every single drop of His Most Precious Blood on the wood of the Holy Cross on Good Friday to redeem. Mr. Creighton's Speculative Comment: Old Italian Prophecy: "When the White Pope and the Black Pope shall die during the same night, then there will dawn upon the Christian nations the Great White Day." If this prophecy to be taken literally, then we may speculate that the white pope (Joseph Ratzinger) and black pope (Peter Turkson is expected to be elected) may die on the same day and Christendom will be restored. They are not true popes but called pope. No, Peter Turkson did not get elected. However, a Jesuit did. And even though Jorge Mario Bergoglio, who is more Marian than his predecessor, is not nor has ever been the Father General of the Society of Jesus, he was the provincial of the Jesuit Fathers in Argentina and he is now, at least in a manner of speaking, the top Jesuit in the conciliar structures. Why is this relevant. Well, because the head Jesuit is called the "Black Pope." How will Holy Mother Church be restored? "St. Peter then chose the new pope. The Church was again organized..."
"... the sky was covered with clouds so dense and dismal that it was impossible to look at them without dismay... the avenging arm of God will strike the wicked, and in his mighty power he will punish their pride and presumption. God will employ the powers of hell for the extermination of these impious and heretical persons who desire to overthrow the Church and destroy it's foundation. .... Innumerable legions of demons shall overrun the earth and shall execute the orders of Divine Justice... Nothing on the earth shall be spared. After this frightful punishment I saw the heavens opening, and St. Peter coming down again upon earth; he was vested in his pontifical robes, and surrounded by a great number of angels, who were chanting hymns in his honor, and they proclaimed him as sovereign of the earth. I saw also St. Paul descending upon the earth. By God's command, he traversed the earth and chained the demons, whom he brought before St. Peter, who commanded them to return into hell, whence they had come. Our days are indeed short. We do not know the day or the hour of Our Blessed Lord and Saviour's Coming for us at the end of our lives. To prepare for this terrible moment of our Particular Judgments is never easy. It is even more difficult in these days of apostasy and betrayal, which is why we must not only flee from the false church of conciliarism but also be humble sheep to shepherds who have been courageous enough to serve us despite all of the humiliations that they must endure for doing so. We must be grateful for having access to the daily offering of the Immemorial Mass of Tradition offered by such shepherds and for having a refuge from a world of insanity that flows from the abomination of desolation that is the Novus Ordo and its false doctrines and the paradoxes and contradictions contained within the conciliar ethos that gave birth to it and is communicated by it, as witnessed by the travesty that Bergoglio presided over in 2011. Our Blessed Lord and Saviour Jesus Christ gave us His Most Blessed Mother to be our Mother as she stood so valiantly by the foot of His Most Holy Cross as He shed every single drop of His Most Precious Blood to redeem us. He has instructed her to give Saint Simon Stock the Brown Scapular, which was worn with such great priestly dignity by Saint John of the Cross, a true son of Carmel, and to give Saint Dominic de Guzman her Most Holy Rosary and to give Saint Catherine Laboure the Miraculous Medal. He has let His Most Blessed Mother teach us through her apparition to Juan Diego that He wants the entirety of the Americas converted to His Social Kingship as she is honored publicly by men and their nations, and He has warned us through her apparition at La Salette in France of impending doom in the Church and the world as a result of the sins of men. And He has told His Most Blessed Mother to console us with her Fatima Message, which is why we really should be earnest in praying as many Rosaries each day as our states-in-life permit. In the midst the chastisement that Our Lord desires us to suffer through at this time, we must pray to Saint Anthony, the Hammer of Heretics and a true son of Saint Francis of Assisi, to hammer Luis Mario Bergoglio into abandoning the conciliar religion to accept Catholicism in the holy integrity of its doctrines and liturgy. Saint Francis of Assisi hated heresy. The great Saint of Assisi who bore the brand marks of Our Crucified Lord on his holy body is thus very dishonored and defamed by a heretic taking his name as putative pope. Saint Anthony of Padua, Hammer of Heretics, hammer the truth into the apostate head of yet another talking apostate who has dared to take the holy name of your holy founder, Saint Francis of Assisi. Remember, every Ave Maria we pray helps us to prepare for the hour of our deaths as we seek to repair the damage caused by our sins and those of the whole world. May we be generous in praying our Rosaries as the consecrated slaves of Our Blessed Lord and Saviour Jesus Christ through the Sorrowful and Immaculate Heart of Mary, remembering, a true Charity demands, to pray fervently for the conversion of the conciliar revolutionaries before they die. We must never be unbent in our sins and we must never be unaware of how we must give God the honor and glory that are His due as members of the Catholic Church who have fled to the catacombs to seek true succor from true bishops and true priests. Our Lady of the Miraculous Medal, pray for us.